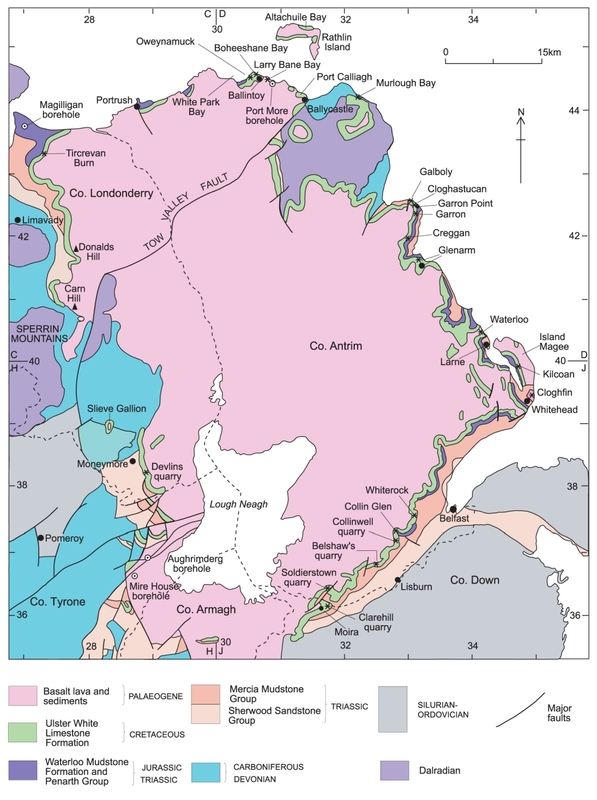 The Clay-with-Flints is the only deposit in Northern Ireland that represents part of the 10Ma gap between the Late Cretaceous chalk (late-early Maastrichtian) and earliest Palaeogene basalt lavas (c. 59Ma). 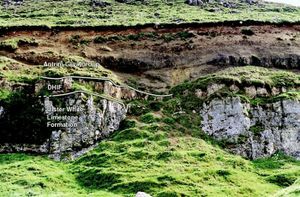 It is exposed at the margins of the Antrim Plateau and consists of multicoloured clay with clasts of flint derived from the Cretaceous chalk. The deposit was traditionally believed to have formed as a palaeosol (P948015), combining the weathering products of chalk and flint, an aeolian component and illuvium from the overlying basalt lavas. 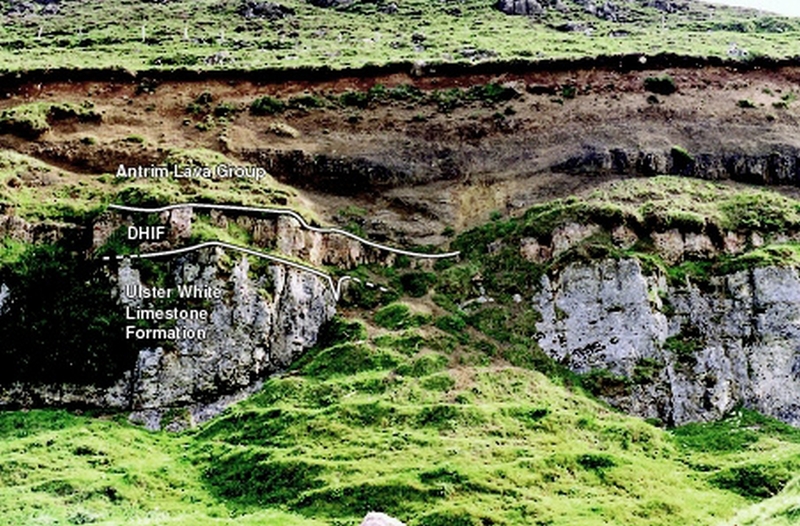 It is now recognised that contemporaneous volcanism contributed much of the clay fraction. 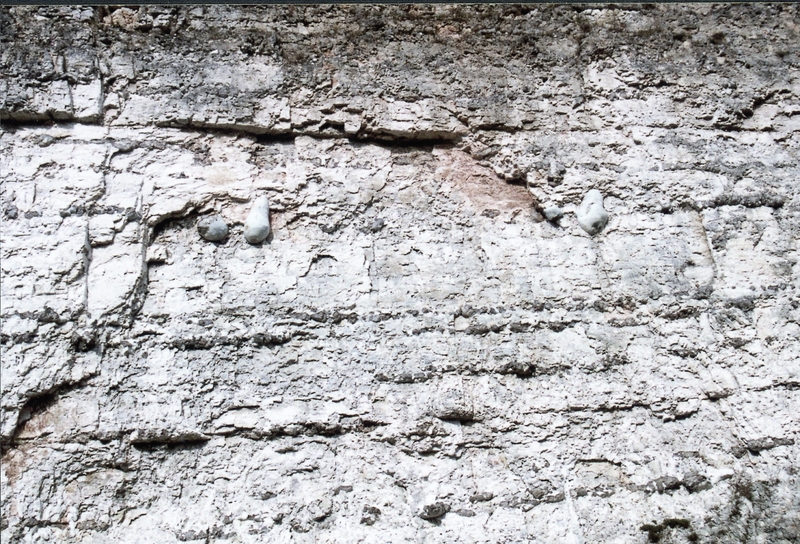 The present thickness of Cretaceous chalk is a reflection of tectonism and the severity of weathering prior to the accumulation of the Clay-with-Flints. 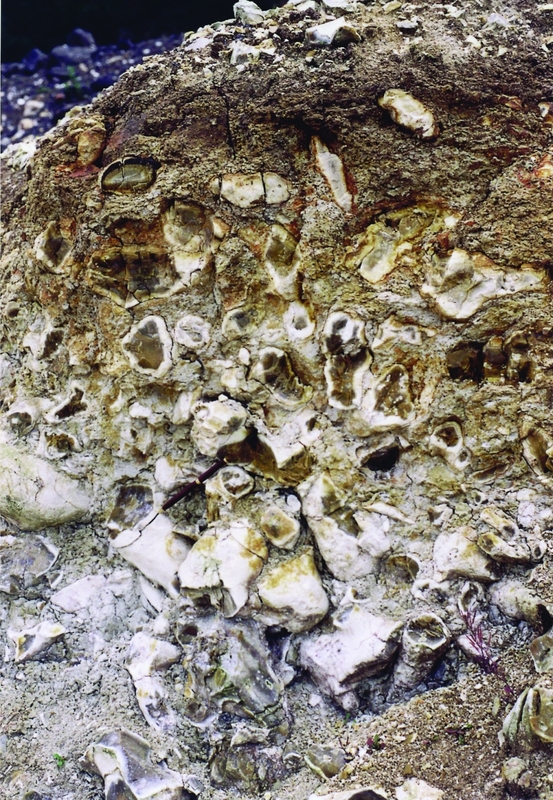 Some indication of the thickness of eroded chalk is provided by the occurrence of paramoudra (P948013) in the Clay-with-Flints at Cloghfin [J 484 942]. 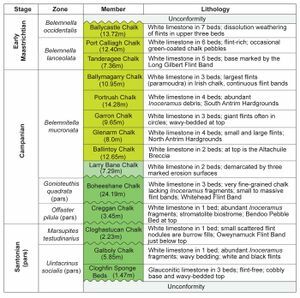 There, the deposit rests on the Glenarm Chalk Member, but since paramoudra are restricted to the uppermost Ballymagarry Chalk Member (P947944) at least 38 m of post-Glenarm Chalk Member, and probably much more, has been removed to release them for incorporation into the Clay-with-Flints. Despite the erosion of the chalk, the Clay-with-Flints probably accumulated on a gently undulose land surface. 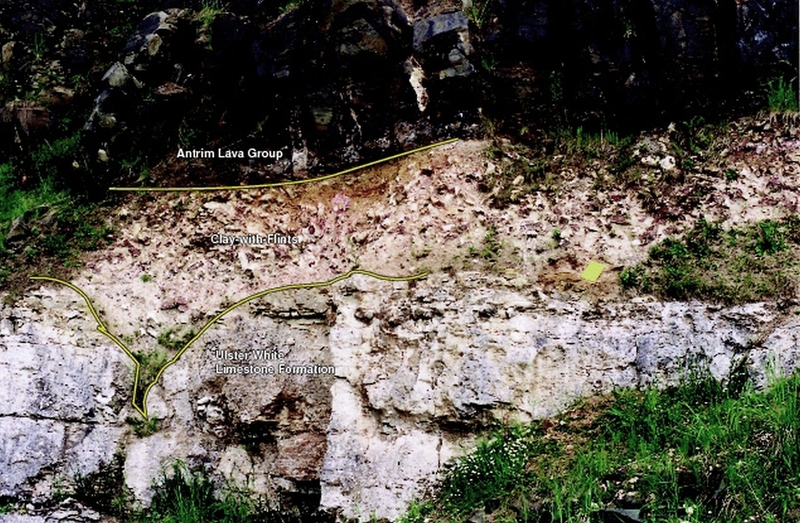 At many exposures, the presence of grikes up to 5 m deep illustrate the effects of solution on the chalk and while usually infilled by the Clay-with-Flints, the intervening clints may also be buried by 1–2 m of the deposit. In detail the Clay-with-Flints comprises a soft, highly weathered, clay matrix consisting of an intergrowth of fine-grained quartz, clay minerals, disseminated opaque oxides and haematite. 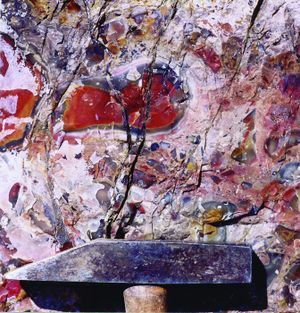 While many of the flint clasts are broken into sharp fragments, some still retain their original shape. This is evident at a shoreface exposure [D 119 416] 250 m northwest of Ballycastle harbour, where there is no clay matrix and the 0.4 m thick deposit consists of self-supporting, whole and fragmented, flints and a matrix of coarse flint chips. The typical Clay-with-Flints deposit is exposed in the cliff face, 100 m to the northwest. The colour of the Clay-with-Flints reflects those of the component clay minerals and ranges from grey and dark bluish grey to white, pale fawn, purplish to deep reddish brown. Flints usually retain the dull grey and greyish brown hues, with a white weathering crust, which predominate in the chalk. 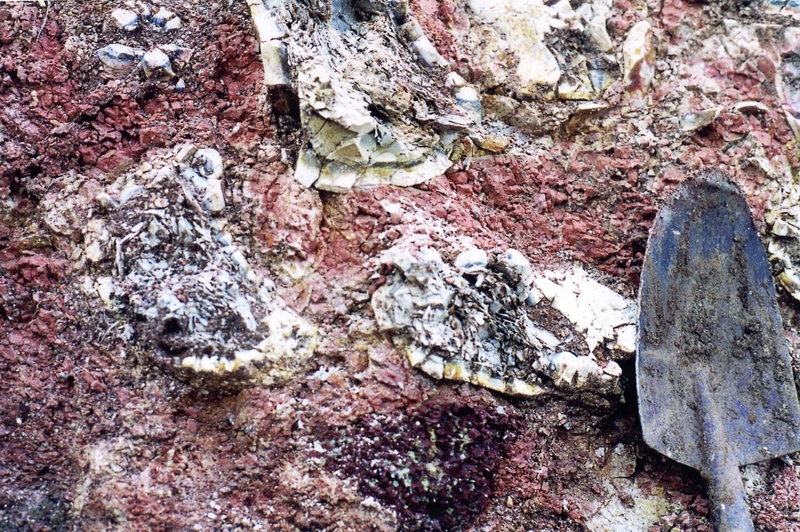 At some localities the flints have a superficial red colour which is merely surface staining. 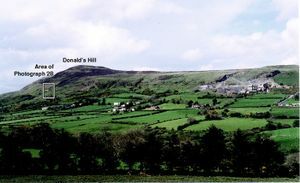 However, at others, such as Donald’s Hill, the flints show a pervasive concentric banding in shades of brown, pink, purple and red probably due to baking. The flint is reddest where it cooled most slowly and in the centre of the clasts is intensely coloured jasper due to haematite production. 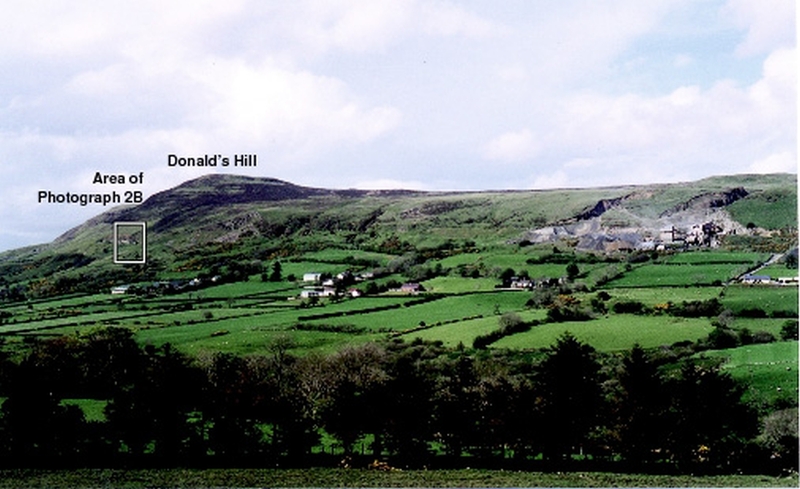 It is now recognised that the main source of the clay component was a volcanic episode or episodes, which occurred before the eruption of basalt lava of the Antrim Lava Group. This is particularly evident at Donald’s Hill (P947855) (P948016) [C 738 180], where the Clay-with-Flints is represented by the Donald’s Hill Ignimbrite Formation (2). This silicic welded ash-flow tuff, although not more than 1 m thick (P948017) and (P948018), has a 30 km long outcrop and formed as a rhyolitic ignimbrite (pyroclastic flow) that resulted from a cataclysmic volcanic explosion. 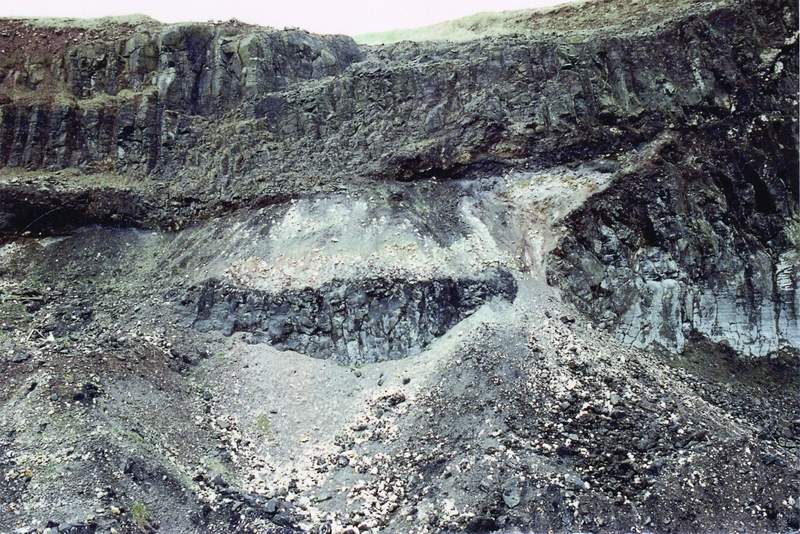 Silicification of the original sediment by fluids percolating downwards from the basalt lavas has produced a bed of extremely hard ash composed of 98% cryptocrystalline silica. 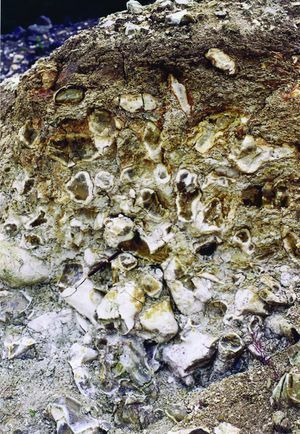 The degree of silicification decreases towards the base of the deposit which consists of hard, unsilicified, pink-stained, flint-rich clay. 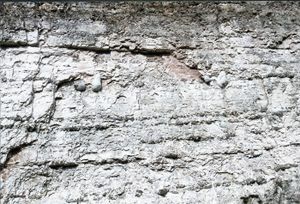 Preservation of flow banding is characteristic of the creamy white to pale brown, pink or pinkish grey fine-grained matrix. 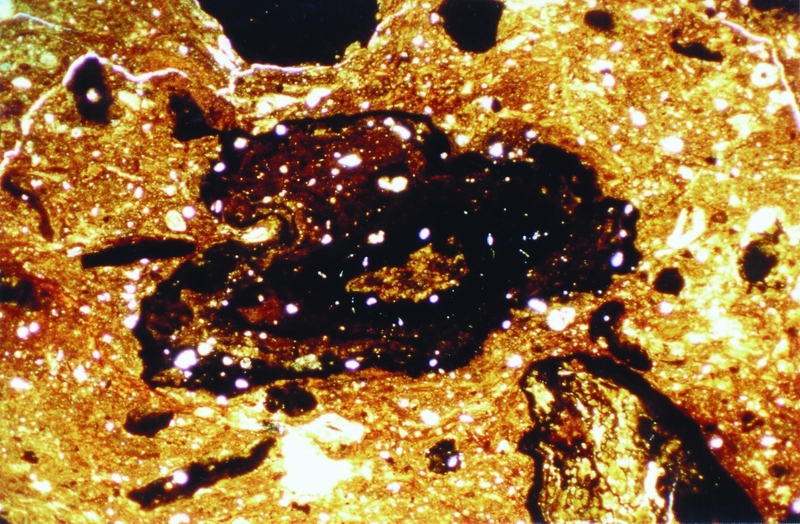 Its eutaxitic texture is defined by deformed glass shards, compacted pumice (fiammé) and volcanogenic lithic clasts of more basic lava and large glassy fragments that are surrounded by the fiammé (Photomicrograph 1). 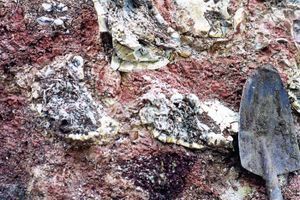 Flint clasts in the upper part of the deposit are coloured reddish brown, purple or pink but towards the base, retain their original pale grey-brown colour. 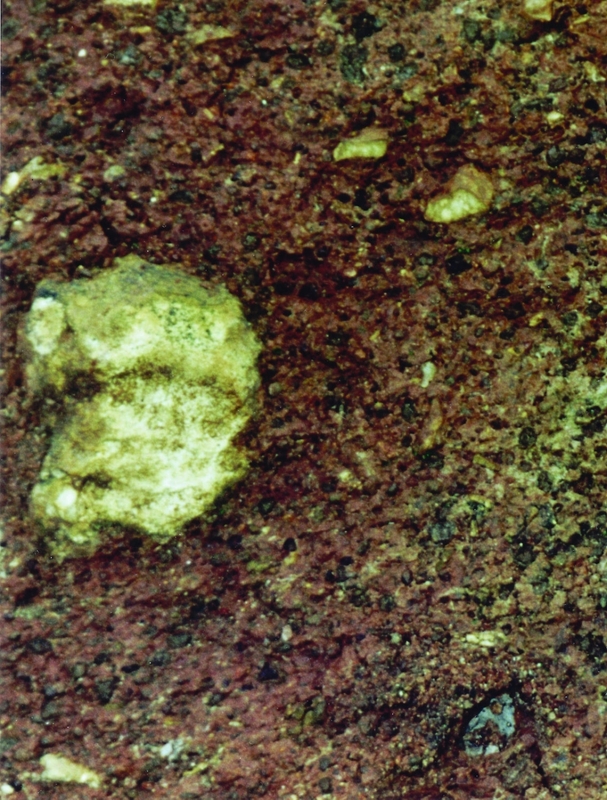 Small pieces of flint show evidence of melting and lobate margins indicating some reaction with the hot ash that probably had a minimum temperature of about 750°C (Photomicrograph 2). Textures and sedimentary structures that are typical of air-fall ash deposits and lahars are also evident in the Clay-with-Flints. At Devlin’s quarry [H 872 816] (P947855), the typical soft clay deposit (P948015) is an unsilicified extension of the Donald’s Hill Ignimbrite Formation. In Gibson’s quarry [H 980 546], west of Portadown, the upper layer of the deposit is an air-fall accretionary lapilli-rich ash almost devoid of flint clasts (P948019), (P948020) and (P948112). At Soldierstown quarry [J 157 634] north of Moira, in addition to the Clay-with-Flints deposit located between the chalk and basalt lava, there is a higher occurrence of lithologies typical of the Clay-with-Flints that are confined to a channel excavated into the top of the lowest lava flow (P948021). 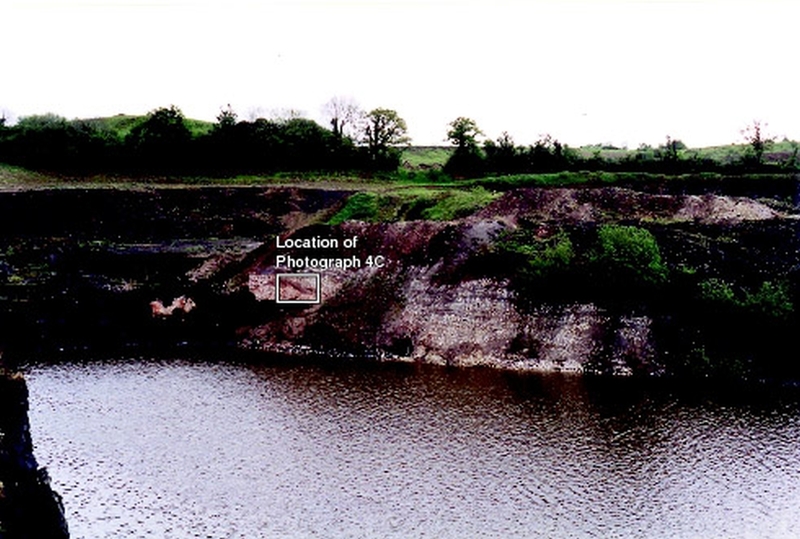 This feature, which occurs on both sides of the quarry, is between 2 m and 10 m deep and over 100 m wide at its north end. The channel fill consists of several layers of bluish grey clay with whole or fragmented flints (P948022). Successive pulses of sediment originated from the south in the form of lahars that flowed over a chalk surface gathering residual flints and mixing them with contemporaneous volcanic ash (P948023). 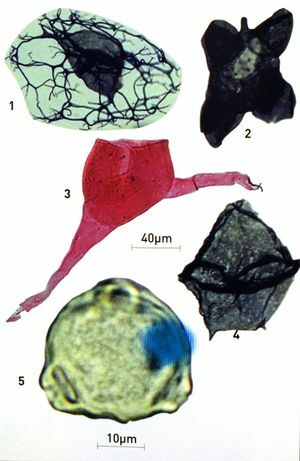 The Palaeogene age of the Clay-with-Flints is determined from low diversity assemblages of pteridophyte spores and bisaccate plant pollen such as Liquidambar and Milfordia which have a Palaeogene range base. At Belshaw’s quarry [J 229 671] (P947855) the basal clay of the deposit yields abundant reworked Late Cretaceous dinoflagellate cysts. Key taxa such as Cannosphaeropsis utinensis (P948082) Fossil 1 Neoeurysphaeridium glabrum (P948082) Fossil 2 and Odontochitina operculata (P948082) Fossil 3, of late Campanian-early Maastrichtian age (Belemnella lanceolata Biozone) are associated with the long ranging form Palaeoperidinium pyrophorum (P948082) Fossil 4. The black colour of the dinoflagellate cysts is caused by secondary heating, in excess of c. 200°C, by a nearby basalt dyke. The organic residues also contain wood and plant tissue, rare insect debris (largely wing material) and other biogenic material from the chalk such as phosphatic nodules, fish scales and teeth. At Tircrevan Burn [C 703 322] the Clay-with-Flints is succeeded by at least 0.4 m of soft, greyish blue, carbonaceous clays and dark grey to black lignitic clay and lignite which are overlain by basalt lava. 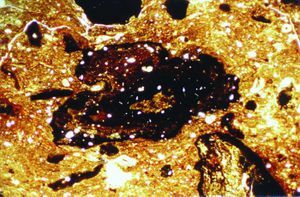 Organic residues contain plant tissue, wood fragments, long-ranging Cretaceous and Palaeogene spores and pollen including Caryapollenites simplex, Triatriopollenites, Tricolporopollenites and Trivestibulopollenites betuloides (P948082) Fossil 5 of Palaeogene aspect. The range base of Carya pollen is in the Palaeocene. 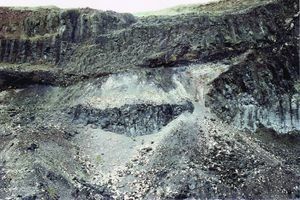 Based on an age of 59Ma (early Thanetian) for the first basalt lava, the lignitic beds are either late Danian or Selandian in age and were deposited in low-lying, swamp conditions with a cool temperate climate. ↑ Smith, B J, and McAllister, J J. 1995. 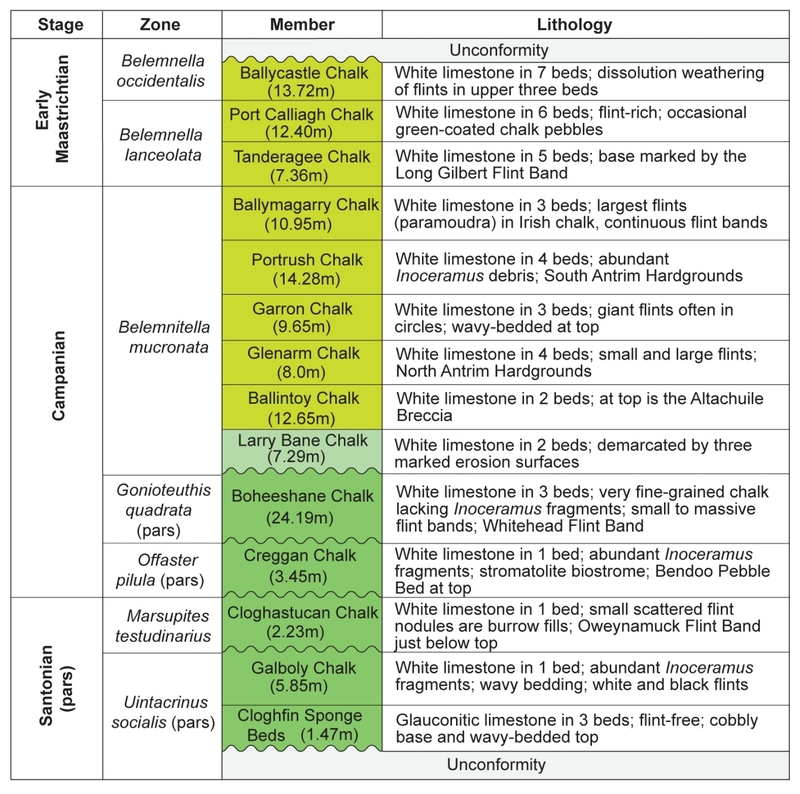 Mineralogy, chemistry and palaeoenvironmental significance of an Early Tertiary Terra Rossa from Northern Ireland: A preliminary review. Geomorphology, 12, 63 73. ↑ Mitchell, W I, Cooper, M R, Hards, V L, and Meighan, I G. 1999. An occurrence of silicic volcanic rocks in the early Palaeogene Antrim Lava Group of Northern Ireland. Scottish Journal of Geology, 35, 179–85. This page was last modified on 25 September 2017, at 12:46.